Quackdown! - What do we know about AIDS deaths in South Africa? 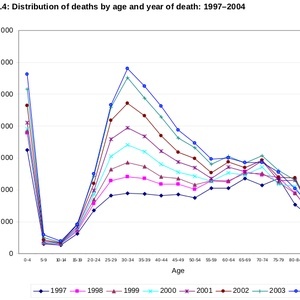 Published: Jan. 16, 2012, 9:10 a.m., Last updated: Jan. 26, 2012, 12:58 p.m.
Age pattern of deaths in South Africa, 1997-2004. Source: Stats SA. It is very unlikely that any genuine expert in AIDS statistics would have given their paper the go-ahead. The article will have no influence on medical science. Nor is it likely to influence the South African government; the days of state-supported AIDS denialism are gone. Nevertheless its publication and the subsequent unnecessary publicity it received in the world's leading science journal, Nature, provide a good opportunity to explain how we do know there is a massive HIV epidemic in South Africa. The two main arguments Duesberg et al. offer are that (1) the population has increased by 20 million in the past three decades and (2) mortality reports released by Statistics South Africa (Stats SA) show relatively few AIDS deaths. The first argument, that the population has increased, can be swiftly dealt with. The second argument is one that has been raised repeatedly by denialists, despite the fact that a little bit of analysis shows it is wrong. Stats SA regularly publishes a mortality report which tabulates death statistics based on death notification forms. Every time someone dies in South Africa, a death certificate is supposed to be filled in and eventually finds its way into national statistics. A doctor is supposed to indicate the underlying cause of death and Stats SA always publishes the top 10 such causes for natural deaths. It is true that HIV as the underlying cause of death features near the bottom of the top 10 and is quite low. For example in 1997 there were just over 6,600 recorded HIV deaths and this rose to just under 18,000 in 2009. In a country such as South Africa, where the HIV status of the deceased is often unknown or the medical certifier does not have access to a full medical history, mis-classification to the immediate cause of death rather than the underlying cause often takes place. Furthermore, since 1992 it has been possible for traditional headmen to complete an abbreviated death notification form, often resulting in misclassification of the cause of death to a generalized ill-defined rubric ... in some rural areas. In addition, some doctors are reluctant to write HIV as the underlying cause because, even though the cause of death is noted on a confidential form, they remain worried that insurance companies will access the forms and thereby deny funeral and life-insurance payouts to the families of the dead. But the evidence for a massive increase in deaths due to AIDS is nevertheless abundant from the death data. The number of recorded deaths from opportunistic infections associated with HIV has risen dramatically. For example Tuberculosis deaths rose from 22,071 in 1997 to 77,009 in 2006. This is by far the biggest cause of recorded deaths. Influenza and Pneumonia deaths rose from 11,518 in 1997 to 52,791 in 2006 to become the second-largest cause of death after TB. Deaths due to Intestinal Infectious Diseases was not in the top 10 in 1997. In 1998 it was 9th at 8,808. In 2006 it was 3rd at 39,239. Most of the increases in these causes of death were almost definitely due to HIV. By contrast death from Ischaemic Heart Disease rose marginally from 9,797 in 1997 to 13,025 in 2006. Diabetes deaths rose a bit more significantly, from 10,828 to 19,549 (and South Africa is indeed experiencing a diabetes epidemic). While these causes of death are not commonly associated with HIV, it's quite conceivable that their relatively small increases are at least in part explained by HIV since we know that HIV also increases the risk of death from non-AIDS causes. For example, the SMART trial found that untreated HIV causes increased risk of dying from heart disease. With the introduction of antiretroviral treatment (ART) in the public sector in 2004, the number of people on treatment has risen to approximately 1.5 million. This correlates with a decline in recorded deaths in recent years, which is what would be predicted by an increase in the number of people taking ART. This decrease in deaths is the one silver lining of the South African epidemic. Andrew Warlick and I prepared the graph below for the Treatment Action Campaign some years ago. It shows the changing age pattern of deaths in South Africa. It is perhaps the most compelling proof of the massive HIV epidemic in SA. It destroys AIDS denialism in one pretty picture. It shows how in 2004 the women who died in South Africa were mainly young adults, not old people. This was in contrast to 1997 as well as the situation in Brazil in 2004, a country with a comparatively tiny HIV epidemic. Only the presence of the large HIV epidemic in South Africa can explain this. In 2002, Stats SA closely analysed a 12% sample of death certificates. The death certificates often contained synonyms for deaths caused by HIV and, in contrast to the standard mortality reports that Stats SA publishes, these were counted as AIDS. It offers clear evidence of the growing epidemic. In 1997 TB and HIV were responsible for 6.5% and 4.6% of underlying causes of death respectively. This steadily rose to 9.7% and 8.7% in 2001. The only larger causes were Unspecified unnatural causes (15.3% and 8.2% in 1997 and 2001 respectively) and ill-defined causes of mortality (8.6% in 1997 and 2001). Influenza and Pneumonia deaths rose dramatically too. But deaths due to diseases not usually related to AIDS didn't show similar increases. For example, heart disease deaths declined. In 2001, the Medical Research Council published a meticulous study based on the Department of Home Affairs Population Register. The report carefully and convincingly showed rising HIV mortality in adults. The Actuarial Society of South Africa uses multiple sources to calibrate its models in order to come up with the best estimate of the number of annual AIDS deaths in South Africa. Their latest published model, ASSA2008, calculates that between 1997 and 2008, 2.1 million people died of AIDS in South Africa. That's an average of nearly 500 people per day. It's difficult to fathom such a catastrophe. By comparison it's almost the equivalent of the 2004 Tsunami happening in just one country every year, year after year. In 2006, the worst year of the epidemic so far, over 700 people died daily. All of the above is of course ignored by Duesberg et al. But it is well known to experts on the South African epidemic. This raises a perplexing question: who were the peer reviewers of the Duesberg et al. article? It is very unlikely that any genuine expert in AIDS statistics would have given their paper the go-ahead.